If your Masters golf bet sunk to the bottom of Rae's Creek along with Jordan Spieth’s golf ball, don’t worry: Sportsbettingonline.ag is giving you a mulligan. 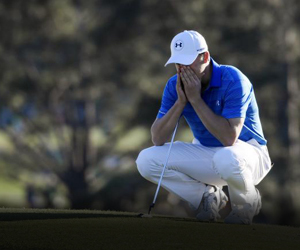 The popular online sportsbook is gladly paying out all outright tournament champion wagers on Spieth, who averaged 10/1 odds for the 2016 Masters ($100 bet would win $1,000), despite his now-infamous collapse on the Par 3 12th hole at Augusta National Sunday. Spieth seemed destined for a second straight Green Jacket when he fired a quadruple-bogey on No. 12, putting two shots in the water at the tricky Par 3. He went into the hole with a 1-shot lead and left No. 12 three shots behind the leader. Spieth eventually tied for second place with Lee Westwood, three behind tournament winner and 2016 Masters champion Danny Willett. This isn’t the first time Johnson and Sportsbettingonline.ag have come through for customers on the wrong end of a crushing collapse. Back in 2012, Adam Scott dealt his fans a similar snub by blowing a 4-shot lead with four holes to go in that year’s British Open Championship. Sportsbettingonline.ag quickly refunded all tournament winner bets on Scott. Spieth’s blunder on No. 12 puts him in line with Greg Norman for the most famous collapse in Masters history. Norman botched a 6-shot lead on the final day of the tournament in 1996 and also feel victim to the water on the 12th hole at Augusta. However, unlike those Norman bettors who were bitten bad by the “Great White Shark” that year, thanks to Sportsbettingonline.ag 2016 Spieth bettors can collect their green even though their man didn’t win the Green Jacket.